Safety, especially in regard to the game of football, cannot be emphasized enough and this is why a player is trained to adequately protect himself in the game as failure to do so might result in a serious injury which might render him incapable of playing ever again. Football has since inception evolved in a number of areas and most importantly is how players maintain their safety while playing on the gridiron. 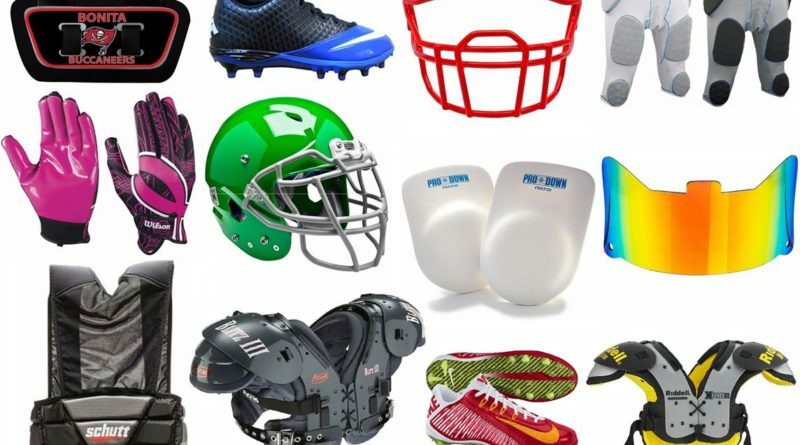 Let us look into a number of accessories that can be used by football players to protect themselves. Visors are the curved pieces of plastic which are attached on to the masks of a football player so as to cover their eyes. There is a wide range of benefits gained by wearing a football visor. Protecting the eyes – Protection of the eye against injuries is this accessory’s main function. There is always the risk of being struck in the eyes by fingers, feet or even the football during play and this is where the visor comes to a player’s aid. 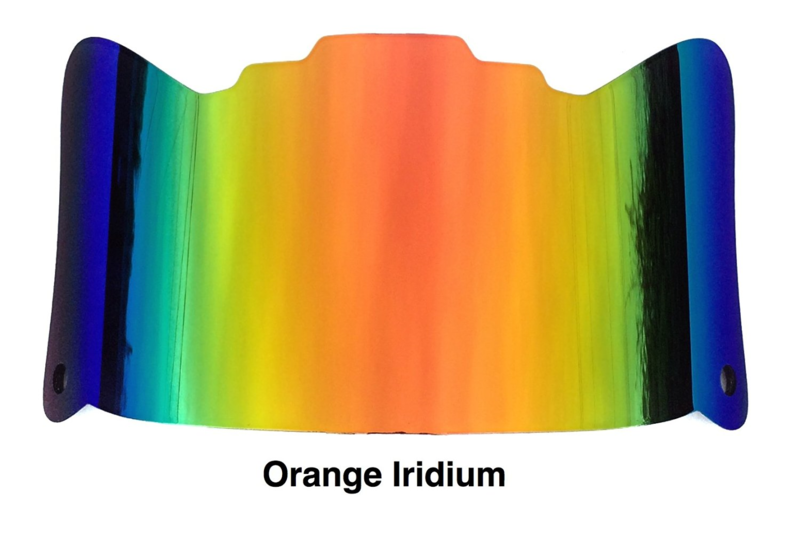 Improvement of vision – There are two main ways that football visors help in improve the vision of a player. First is by acting as a light filter and helps to filter out bright sunlight in a similar way of function as the sunglasses. Secondly is through correction of vision whereby players who have less than perfect vision have recommended visors for them. They function by allowing the players to see properly without the need for contact lenses. Hiding the eyes- When wearing tinted football visors, a player’s eyes are hidden from his opponent. This can prove to be a big advantage although it poses a safety risk on the other hand. There is the need to see the eyes of an injured player so as to assess his condition by the person tasked with providing first aid in case of injury, and so tinted visors pose a challenge to this. 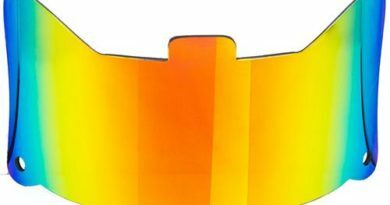 They are a way of expression – In a bid to express a certain style for themselves, some players choose specific types of visors such as the ones from SHOC brand which feature a distinct color or pattern. They offer a firmer grip- The core function of the gloves is ensuring that a player has a firmer grip on the ball as he makes the catch. The gripping surface of football gloves is variational as you can find a number which spots patches of silicon whilst there is a range of others with small bumps of rubber. 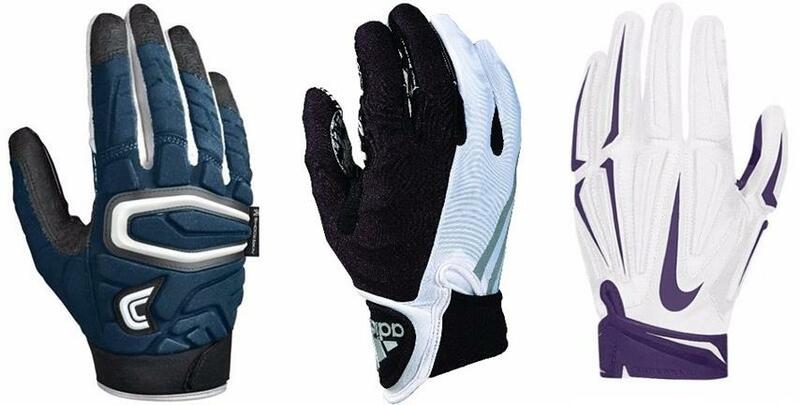 Hand Protection- It’s the job of gloves to accord safety to a player’s hands. The force of an oncoming ball may oftentimes be very strong and may cause abrasions and even cuts to the hands. So to avoid all this, quality gloves are a sure way. Protection in different weather conditions- The weather condition during a game may sometimes be rainy or very snowy which often causes a slickness on the hands and even on the ball itself. During such a time, the glove becomes very useful in giving the player great traction to keep the ball well in their hands. The facemask is the part of the helmet which directly covers the face of the player. This is a crucial accessory in the protection of a player’s face as they are usually made out of metal that has been covered with either rubber or plastic. The details of the facemask range widely and are dependent upon every player and his kind of needs. You, for instance, may find out that a quarterback’s facemask could be a single running horizontal bar previously since there is a need for a view of the entire field. But this isn’t the case these days as such types of facemasks are not allowed anymore in most levels the exception being for those players who began using them before the rules were implemented. The main benefits of facemasks are for an improvement of the player’s vision, as a way of expression and most importantly, to protect the wearer. We can all agree on the fact that football is a very aggressive sport and the tendency that it has to be very physical means that the potential for collisions of high impact are almost inevitable. Football girdles are a very essential in protecting the player on the gridiron. The player’s lower torso and the hip are common zones of impact and the training if a player usually features how to properly wrap them up when tackling the opposition. They serve a crucial role of supporting an athlete’s private parts from the occasional bumping and stress of the muscles from running. The padded football girdles aid in holding the bones and muscles in place when the game starts. They are essential for a tight fit. It helps in keeping the muscles intact and in a tight fit thereby preventing cramping of the legs. They help in maintenance of a proper posture. The helmet is used in reference to the protective sports accessory used by football players on their heads with a wide usage seen in Canadian and American football. The main components of a football helmet are a hard shell built out of plastic and having a thick padding in its interior, a facemask that is built out of metals bars which are usually coated with plastic and a chinstrap. There are many benefits of a helmet but most important of all is to prevent concussions which are typical in any football game. 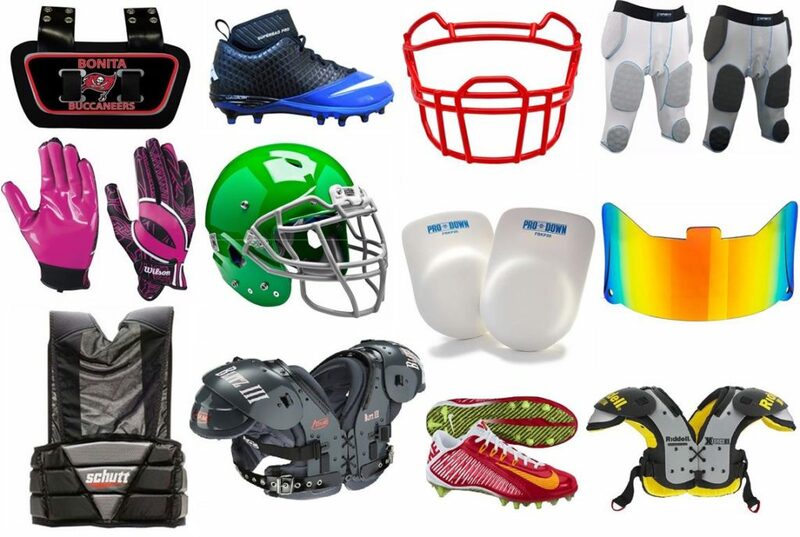 Dangerous as football is, it becomes very hard adequately protecting yourself despite all the advancements that have been made in regard to the protective pieces of equipment for the game. Despite all that, some indispensable accessories such as the shoulder pads have been made. Shoulder pads are classified according to the position of playing of each player. This is why we have the Lineman’s shoulder pads, the quarter back’s shoulder pads and etc. All in all the shoulder pads are a very crucial accessory which every player must put on before getting on to the pitch. The kneepads are a form of pads which serve as a protective measure to help prevent a player from injuring or damaging their knees. Their core function is in guarding the knees so that in the event that a person twists them in the wrong way, gets a blow onto the knees or even falls down, the resultant damage is on a much smaller level and that it won’t cause a hindrance to the player ability to play again. Protecting the knees by use of the knee pads means that the player is protecting his ability to walk comfortably, jump, run and most importantly play efficiently. Cleats are without argument one of the most important piece of sports accessory ever made for the game. Their very role helps in literally keeping the players on the ground. You can never ever go out to play on the gridiron without having put on some quality cleats. The weather during a game can usually turn out for the worst and regardless of what the weather has for the day, quality cleats are indispensable and they will ensure that a player isn’t facing any hindrances whatsoever. The football back plate is a protective gear which is very important in absorbing impact which arises from the violent contact of the body with opposing players. Like all other equipment that is used in football, a quality back plate should be sure to protect a player whilst not adding any more weight to bog him down. 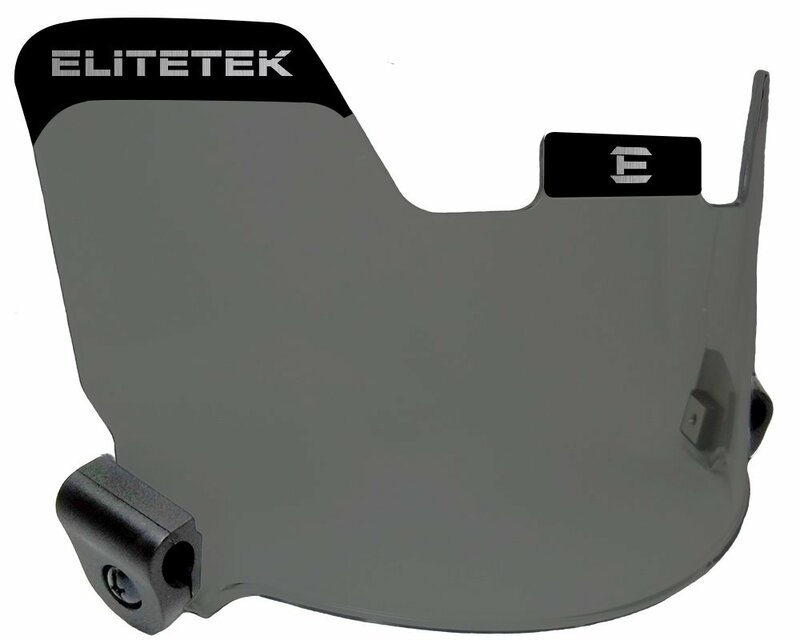 It is easy attaching the back plates to a number of shoulder pads on the market today so that the spine, lower back and the player’s kidney are well protected from injury by reducing the impact that is received from hits on the back. The back plates are designed to be worn by adults, teens and younger players in the game. The issue of rib protection in football is an important one, the rib protector is a protective sports accessory usually attached to the shoulder pads so as to protect their ribs. Wearing of the rib protector is optional but then for assured safety on the gridiron, it wise putting one to use. For skill player like the quarterback, this is a very crucial piece of equipment and the reason as to this is because this players are the most likely to get tackled as they have the balls in their hands and so leaving the ribs unprotected could prove fatal.